Heres some stuff that you dont really need to know, but im going out of my way to tell you anyway. Alright well my name is robert and im a 14 year old skateboarder,but thats not all i do.Belive it or not i go to a weekly chess club at a community college near my house.I love chess and any other strategic game for that matter.You can see my favorite computer games at the favorite things part of this page. 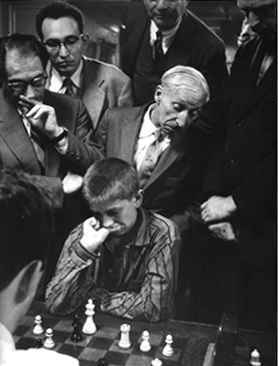 Check out this picture below, its a photograph of the great bobby fischer. Alright heres a quote i read somewhere before that i think is a good saying. Your life is a test and the world a great trial. Here I might use a Sound Web Gem to add an MP3 of a favorite song, so it plays whenever this page is displayed.